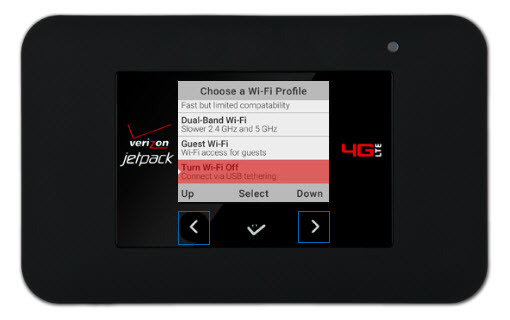 To disable the Wi-Fi connectivity on your Jetpack and set up a tethered connection, view this info. This feature only works on Windows 7 or higher. Connect the device to the computer using a compatible USB cable then use the arrow buttons on the Jetpack to select Tether (USB network). If the 'Tether (USB network)' option is not presented, on your device navigate: Settings > Wi-Fi > Turn Wi-Fi Off then connect to the computer. Launch a web browser to test connectivity. Allow adequate time for the computer to detect the device and install the necessary driver software then, if prompted, select Tether (USB connection) to connect. The device is set up and functions as an Ethernet connection (you don't need any connection software). If needed, access the Admin Web Interface. From the left menu, click Connected Devices (located at center left). From the Connected Devices section, view your computer's MAC Address to confirm you're connected. When using the tethered modem connection feature, you are unable to connect any devices via Wi-Fi.